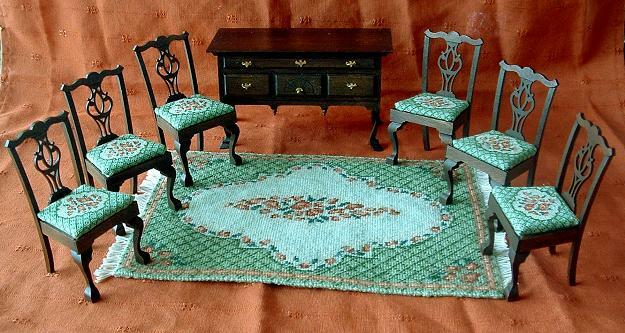 Christine from Belgium made the Barbara, large (green) carpet first, then bought the matching dining chair kits. 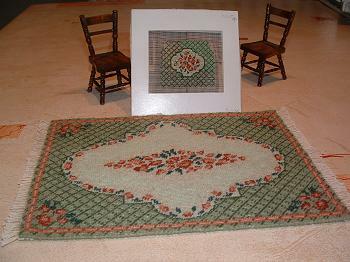 The finished carpet, along with the partially-completed matching dining chair design, still in the card mount. Christine says she classes herself as a beginner, but her stitching looks very proficient to me! Here is the carpet, complete with all six matching chair seats – although she says that doing so many chair seats was a lot of work! She is very happy with the finished result, though – and I’m not surprised! They look great.